The last few years have been tough for the Japanese giant. The name that has always been revered for its innovation has stood by and let the likes of Apple, Microsoft and Samsung pass them by. It seemed like Sony was always a step behind. The company that bought the world the Walkman and the Discman let the iPod take the music market by storm. The company that gave us the Playstation saw the Xbox dominate the video game market. After those defeats, it looks like Sony is preparing to dominate again. Their latest moves could signal a sea change in the entertainment world. Sony recently acquired a company called Gaikai. Gaikai is a small company that had been focused on cloud based gaming. Gaikai’s strength was in its ability to stream games from its high powered servers to anything from tablets to computers. As gamers have moved away from consoles and gaming based on physical media, companies have looked for ways to move into cloud based gaming. Gaikai made a name for itself in this space and that is what intrigued Sony. As Sony continues development on its next generation gaming console, a move like this was not entirely unexpected. Sony knows that it will need something big when they launch that console. An increased presence in cloud based gaming will be a big thing. Gaikai will allow them to stream games to almost anything, not just gaming consoles. Imagine a game being streamed to a smart TV. That is what Sony could be thinking. But gaming is not the only thing that this acquisition can help with. Gaikai’s technology can also be used to stream digital content such as movies and music. This is where industry analysts and observers believe Sony is looking to establish a larger presence. 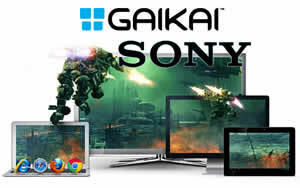 Gaikai’s technology could allow Sony to stream TV shows, movies, music and games to anything that they wanted to. Consumers could get content on their consoles, laptops, tablets and smartphones. They wouldn’t need a computer to play a PC game. They wouldn’t need a PS3 to play a PS3 game. They wouldn’t need a television to view a TV show or movie. The potential applications are mind-blowing. Sony seems poised to return to their glory days. Gaikai could allow Sony to put the full power of their television, movie, music and gaming library into the cloud. Sony could make everything available to any device that is connected to the internet. And they would be able to get any price that they want. That’s where the real power lies.